The folly of the admiral's son. Around mid 17th century, Dutch economic power was at its top. There was now an upper class of extremely wealthy families who had no problem with being rich. Rather contrary to Dutch tradition of sobriety they started to build sumptuous country mansions. To show off, and also for more practical reasons. They all had comfortable houses in town, but in summer you can be sure cities like Amsterdam were drenched in an horrific stench. Poor hygiene with all these canals being in fact open sewers, also leading to pest and disease. So most of these opulently rich families lived in town in winter, and for summer they had their country mansion. All around the major cities you still find numerous of these fine places. In our region as well. Along the river Vecht and other smaller waterways, and close to the higher sandy heather plains in the east. Here real estate development on a larger scale took place. First meters thick layers of sand and dunes were removed, and transported by barge to booming Amsterdam for building purposes. Then the now levelled land was parcelled out. Trompenburgh, the manor house on the picture, is a pretty special one. 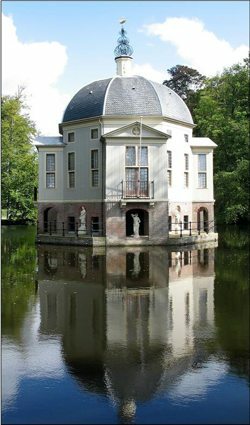 It was built by Cornelis Tromp, the son of Maarten Tromp, one of the most famous Dutch navy admirals of the 17th century. After his father had been killed in the First Anglo-Dutch war, Cornelis Tromp aspired to become a legendary hero of the high seas as well. Money enough, so he had this splendid country mansion built. Shaped more or less like a ship floating on the water. With on the land side an entrance protected by a couple of gun ports. While on the roof railings and a ships bridge, from where he could watch ships sailing into Amsterdam. 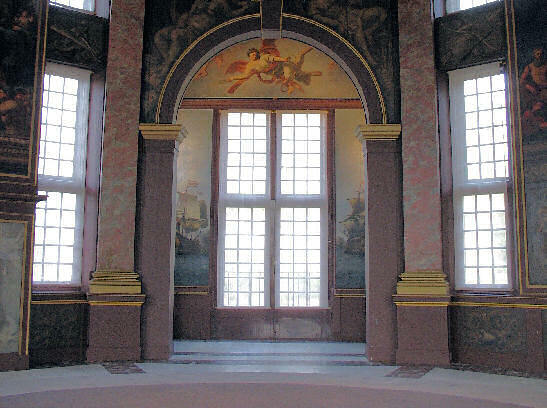 The interior stuffed with expensive marble and murals depicting ships, naval battles and family portraits in style. Here the guests, the rich and famous of the time, could admire the glorious deeds of the Tromp family. Cornelis Tromp had a navy career alright. But to his disillusion, even this magnificent folly was not enough to make his star rise above the fame of his father. The man ended his life as a notorious drinker. With a bike tour, we can cycle along this, and other country mansions.